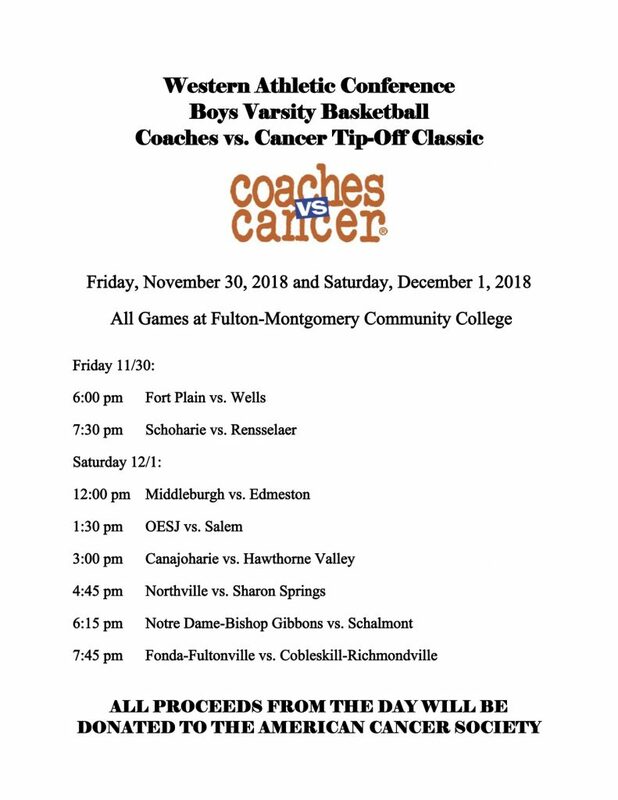 The Coaches vs. Cancer Tip-Off Classic is something I have been running for a few years now with our league, the Western Athletic Conference (Section 2). This is the 6th year we will be holding this event. Last year we raised $4,526.75 and the year before $4,103.00 for the American Cancer Society. We have 16 schools involved this year and the event will feature 8 Boys Varsity Basketball games at Fulton-Montgomery Community College on November 30th and December 1st. We collect admission and have many different raffles for various items donated by the community. All proceeds from the two days are donated to the American Cancer Society. Some student-athletes from Northville help in the organization before the event and we typically have some student-athletes volunteer the day of the event to help with admission and the raffles. This is a truly amazing event and we are very proud of how much it has grown over the past few years.